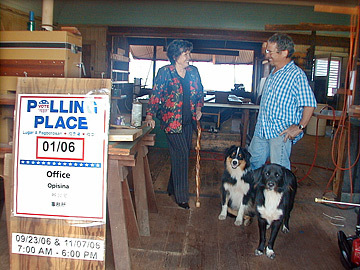 Ookala precinct election official Sharon Lehman talked Wednesday with Peter Ziroli, owner of the woodworking shop which will become a polling place tomorrow. OOKALA, Hawaii » Big Island woodworker Peter Ziroli promises to have sawdust vacuumed from his shop by the time voters cast ballots there tomorrow. Election worker Sharon Lehman says coffee and cookies will be waiting for voters who want to chat after voting. The only uncertainty is whether Ziroli's Australian shepherd dogs, Lucy and Chili Palmer, will be on hand. The dogs are not registered to vote. Given the shabby 1920s wooden building where Ziroli's shop is located in Ookala, 30 miles north of Hilo, adding in the patched hole in the floor and the rusty corrugated roof which the dogs jump onto through a second-story window, it's fair to say Ziroli will host the funkiest polling station in the 1st House District. The closest competitor in the 1st District list of odd polling places is a storage room at Waipio Valley Artworks in Kukuihaele. Its bright paint makes it a distant second to Ziroli's shadowy, weathered timber. The Artworks sits across a narrow road from the former Kukuihaele polling site, Fanny Kanekoa's garage, which used to offer real dust appeal. But Fanny died a few years ago, and her garage was torn down. The multicar parking lot is still there, so it is easy for Kukuihaele voters to park in a familiar spot and cross the road to the new polling room at the Artworks. The final entry in the list of odd polling places is, frankly, civilized. On the other side of the island but still in the 1st District, Dan Manuel is putting the finishing touches on his brand-new four-car garage in the Hawaiian Homes area north of Kawaihae. Voters will find fresh beige paint, Manuel said. The three sites were chosen because their ground-level entrances make them accessible, said county election official Pat Nakamoto. Election day cookies and coffee will continue the tradition. "This is a fattening place to live," Lehman said. "Everybody knows everybody and if they don't, they will." Also in the compound were cottages used as company offices. One is still Ookala's post office. The others are empty and under attack by termites. Ziroli's workshop is structurally sound, especially since he fixed the hole in the floor, and voters can enjoy the contrast between the old lumber of the building and beautiful planks of koa that Ziroli has stacked against the walls. Even the new doors he built are made of scrap koa. Ziroli's 13 heavy machines, from waist high to head high, will stay right where they are. Voters can detour around them as they walk to voting booths by the window at the back of the room, the same place where the dogs jump onto the roof. » A building used as a polling place Saturday in Ookala on the Big Island was previously used at various times as a dining hall, offices and carpentry shop for a former sugar company. A Page A6 article Friday incorrectly said the building had been used as a company employee clubhouse.